At Conaway Motors we firmly believe that there isn’t anything much more important than your brake service in Lake Stevens. 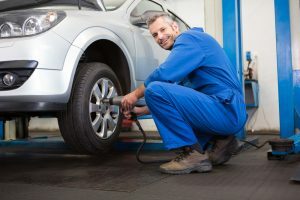 While the motor, transmission, and drivetrain all have to do with putting your vehicle into motion, your brakes are all about stopping – and that can be seriously important. When borrowing or trying out a vehicle that is new to you, one of the first things that should be tested is the brakes. Even brakes that are in good repair can respond differently. For example, the brakes on a 1998 Subaru might almost feel mushy compared to the sharp stopping power of a 2002 Ford Ranger. This doesn’t mean that either vehicle is in poor repair – it is simply the difference between the way the two vehicles are set up. Consequently, it is a good idea to find a deserted or at least low population area and check how those brakes respond before driving out onto a highway or into busy city traffic. Furthermore, brakes aren’t the full story when it comes to stopping power. Your tires are also an important part of that process, right along with road conditions. Tires with poor tread are more likely to skid across a surface than tires with good tread – especially when streets are slick from rain or other precipitation. If you have any question about your brakes’ stopping power, come on over. We’ll check them out properly, and discuss an estimate for any needed repairs. At Conaway Motors we firmly believe that your brake service in Lake Stevens is important to you and your vehicle, so give us a call at (425)905-2424 to get yours check today. We will correctly and honestly diagnose the state of your stopping power and give you a fair and honest estimate of any needed repairs.